The Bible says that God gave His law to mankind – the Ten Commandments written by the finger of God on tables of stone, and placed within the Ark of the Covenant. The second, ceremonial law, given through Moses, was placed next to the Ark of the Covenant. And it was the ceremonial law that was abolished by the death of Jesus, but the Ten Commandments endure and we are going to be judged by them. Ecclesiastes 12:13-14 - Let us hear the conclusion of the whole matter: Fear God, and keep his commandments: for this is the whole duty of man. For God shall bring every work into judgment, with every secret thing, whether it be good, or whether it be evil. Exodus 31:18 - And he gave unto Moses, when he had made an end of communing with him upon mount Sinai, two tables of testimony, tables of stone, written with the finger of God. Deuteronomy 4:13-14 - And he declared unto you his covenant, which he commanded you to perform, even ten commandments; and he wrote them upon two tables of stone. And the LORD commanded me at that time to teach you statutes and judgments, that ye might do them in the land whither ye go over to possess it. Ceremonial law of Moses, which was placed next to the Ark of the Covenant. Deuteronomy 31:24-26 - When Moses wrote the words of this law from beginning to end, he commanded the Levites who wear the Ark of the Covenant: 'Take this book of the law and place it next to the ark of the covenant of the LORD our God, let there be a witness against you. So what law was nailed to the cross? The special law, which is discussed here, is the law of "commandments contained in ordinances". The law of the Decalogue is God's eternal unchanging ethical system. It is the foundation of God's government. It defines our relationship to God and to our fellow man. In this text, Paul deals with the commandments contained in ordinances that God gave Israel to be a symbol pointing to the coming of the Messiah. They became a barrier for the mission of the church. God used these commandments contained in ordinances, such as circumcision, ceremonial washing, annual festivals and sacrificial system, in order to prepare the Jews for the coming of the Messiah. Many Jews distorted the meaning of these symbols and ascribed special merit to the symbol itself. Instead of focusing on its meaning, they emphasized the outward performance of ceremonies. As a consequence, these ordinances became a barrier for the relationship between the Jews and Gentiles, who did not take part in these ceremonies. Ephesians 2:12-13 - That at that time ye were without Christ, being aliens from the commonwealth of Israel, and strangers from the covenants of promise, having no hope, and without God in the world: But now in Christ Jesus ye who sometimes were far off are made nigh by the blood of Christ. Ephesians 2:14 - For he is our peace, who hath made both one, and hath broken down the middle wall of partition between us. Hebrews 9:10 - Which stood only in meats and drinks, and divers washings, and carnal ordinances, imposed on them until the time of reformation. So, what was abolished on the cross? Of course not God's eternal, immutable and unchanging moral standards, His Ten Commandments. 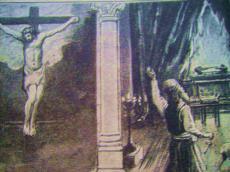 The cross removed laws that were based solely on the provisions given exclusively to the Jews. These regulations perfectly fulfilled in Jesus Christ. AmazingHope.net - Were the Ten Commandments Really Nailed to the Cross?